Denna text är en introduktion till domänhantering och på engelska. When you set up Analytics to track across separate domains, or when you set up Analytics to restrict tracking to a section of your website, you are making adjustments to how Analytics collects visitor data for your web property. 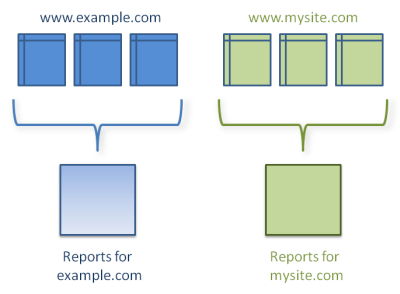 To understand this, let’s first look at a default Analytics setup for a site or web property. By default, Analytics records visits to a given URL as a group. For example, if you set up tracking to your blog — myexample blog.example.com — visits to all pages and subdirectories to your site are collected and tallied as a unit. In addition, Analytics treats visits to separate URLs as unique and unrelated (except for referring links). This is how you would expect Analytics to work, since you would not want visitor data from one website to appear in the Analytics report for a separate, unrelated website. Without cross-domain customizations, a visitor who first visits your online store and then proceeds to your 3rd-party shopping cart is counted as two separate visitors with two separate visits of different durations, which is not appropriate for this model. You can, however, use cross-domain tracking to make sure that Analytics records traffic to these two sites to the same report. In web analytics, this is often called site linking. With it, a visitor to your online store who proceeds to your shopping cart is counted as one visitor—not two—and the session they started on the store is continued through to the time spent on the shopping cart. •Your shopping cart software resides on a 3rd-party site or on another domain. •Your online presence spans multiple sub-domains, and you want a unified report for all visitor data. 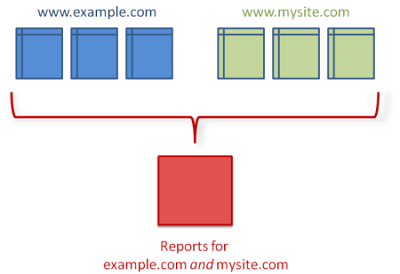 •Some of your site content is displayed in an i-frame hosted on another domain. •You want to track unique areas of your site separately, such as when you want to track a sub-directory separately from the rest of the site. In these situations, you will need to adjust how Analytics collects data so that traffic to separate domains is collected in a single report. •Which landing pages most contribute to sales or to goal completions? For instructions on setting up tracking for these types of configurations, you can read the detailed documentation in Cross-Domain Tracking on Google Code.